Library/Reinforced (L/R) and Trade Hardcover (T-HC) bindings are publisher hardcover books. The Library binding is the best available binding and has been specially reinforced to last longer. It is intended for high-volume library use and is made to withstand the rigors of repeated checkouts. A Trade Hardcover binding is a standard hardcover and is most often what you find in a local bookstore. MackinBound (MB) titles are prebound paperbacks that are a cost-effective alternative to publisher hardcover books and carry a lifetime guarantee. Many paperback books can be converted to a hardcover binding called a MackinBound (commonly called a ‘prebound paperback’). Our MackinBound process uses polyvinyl covers to provide protection, while using the original paperback cover or a professionally scanned version of the original artwork when bound to heavy binder boards. With both covers, the book is rebound; glued or sewn, depending on the thickness of the book and/or the density of the pages to meet or exceed all industry standards, resulting in a durable, hardcover book. All MackinBound books are fully guaranteed against defects as long as the purchased ISBNs remain in print. Paperbacks (PBK) are a publisher’s soft cover binding. Mackin is able to add Kapco covers to paperback titles for a charge of $1.79 per book. Kapco is a clear laminate that is applied to the entire cover to provide protection for the book. We can also provide a Colibri cover on any book for a charge of $1.29 per book. These charges are not reflected on website lists. Flexibound (FLEXI) titles are sewn books wrapped in flexible, turned-edge covers that provide more durability, flexibility and the ability to lie flat. The cover itself is often comprised of a printed sheet turned over a thick cover stock, then film laminated for extra rub resistance. Cookbooks, catalogs, field and travel guides, and directories are popular flexi-cover applications. They are often bound this way to offer ease of use and transport, and offer a less expensive option than a hardback binding, while offering higher quality than a traditional paperback. MASS titles are paperback titles that are produced by the publisher for the mass market. These books are generally smaller and contain lesser quality paper than the traditional paperback. This format is indicated by the MASS heading underneath the Title field on your list or search results. Single-user License: Only one person can use this title at a time. Multi-user License: Simultaneous access is provided so more than one person at a single site can use this title at the same time. Subscription Access: This digital resource is available for a limited period. At the end of the subscription period, you must renew your subscription to continue access. Subscription periods are noted for applicable titles and may be based on timeframe (such as one year) or number of checkouts (such as 26 checkouts). Perpetual Access: You only need to purchase this digital resource once and will have perpetual access. Worldwide Rights: Worldwide Rights (WWR) indicates the title is eligible for distribution outside of the United States in all foreign countries. Please see below for a definition of other formats. Set the Preferred Format Order to filter search results by binding/format before they are displayed. You can choose to NEVER DISPLAY certain formats and bindings that you’d never consider ordering, or prioritize the various bindings by assigning an order of preference to each binding/format you are interested in. When logged into Mackin.com, select My Mackin > My Profile. If the Preferred Format Order is clicked Off, all items from the database that match your query will be displayed with every search. 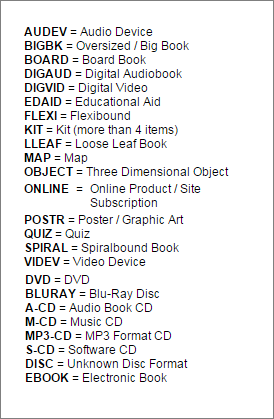 Therefore, you may find that a certain title is available in several bindings and formats, such as library reinforced, paperback, or MP3. If the Preferred Format Order is clicked On, your search results will display only the format types you specify. 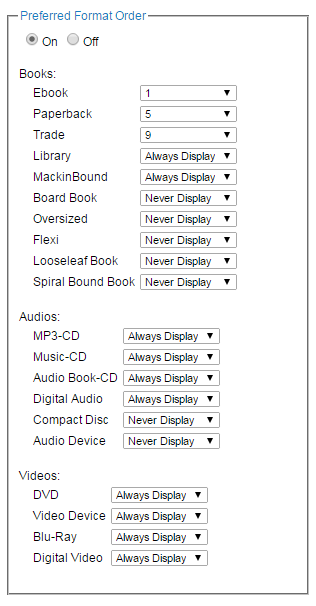 To take full advantage of this feature, assign a preference to the various formats listed for Books, Audios and Videos. You can assign an order of preference by assigning the format a number (1 being your first choice, and 9 being your last choice). If you prefer, you can assign a format type a category of Never Display or Always Display. After assigning preference numbers to the format types and clicking Save Changes, Mackin.com will arrange the format types into numerical order as you selected. 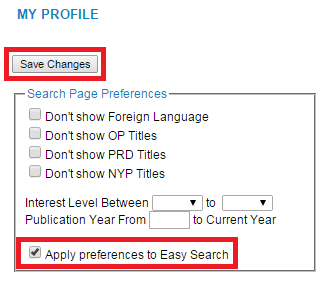 Please remember to click Save Changes so your new selections will be added to your profile. 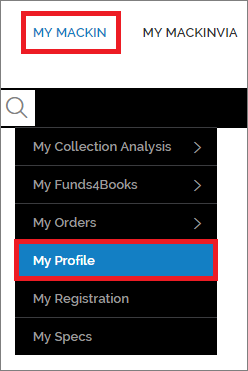 NOTE: Please be aware that the Search Page Preferences you select on the My Profile page may cause future searches to come back with “No Results” when in fact the title is in the Mackin database (e.g. if you have your interest level set at K-2, the Harry Potter series will not come up when you search). If you can’t find the title you’re looking for, please alter your Search Page Preferences to be less specific and see if the title is retrieved.